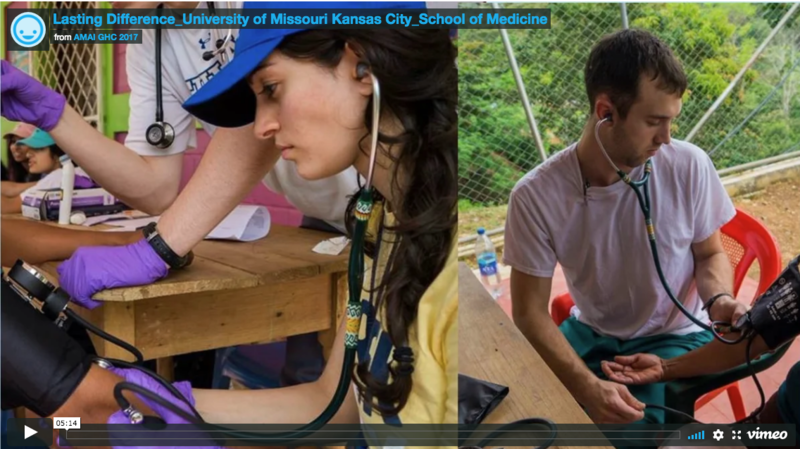 Shannon Demehri and Hunter Faris, two UMKC School of Medicine sixth-year students , are finalists in this year’s AMA Global Health Competition. If they win, they get to go on a medical mission to Ecuador, Guatemala or the Dominican Republic. In the next stage of the competition, they need people to watch their video, “Lasting Difference,” and vote for it by clicking on the “thumbs up” above it. People can vote once a day through July 30. The five teams with the most votes will advance to a final round of judging. Demehri said their video was about the importance of empathy and about “what we would learn from interacting with patients on a global health trip that will make us better health care providers.” In it, Demehri tells her experience treating a young immigrant mother who had fled abuse in her home country and now suffered persistent headaches and insomnia. The key to being able to help her, Demehri said, was learning the woman’s story, empathizing with her and earning her trust. Faris tells of working at a summer camp for children coping with cancer and of bonding with one 11-year-old boy — but only after figuring out how to understand and appreciate his situation and the extraordinary challenges he had already faced. Besides sharing a commitment to advancing global health equity, Demehri and Faris both plan residencies with the U.S. Navy, she in anesthesia and he in general surgery. They also were on a team of UMKC students that went on a medical mission to Nicaragua in 2015. The medical missions are run by Timmy Global Health, an organization based in Indianapolis and founded in 1997 by Dr. Charles Dietzen, a pediatric physical medicine and rehabilitation specialist. He worked internationally in many countries, including with Mother Teresa, before starting the organization to pass his commitment to global health equity on to medical students. Dietzen named the organization after his brother, Timmy, who died in infancy. Timmy Global Health sends medical service teams to support the work of international partner organizations and channels financial, medical, and human resources to community based health and development projects. So far it has treated more than 84,000 patients and distributed more than $1 million in aid to partner organizations.